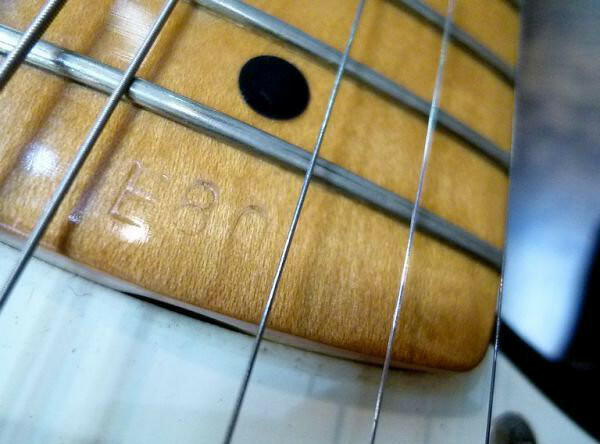 Can anyone shed some light on what the E in front of the 80 might mean on the fretboard stamp? It means someone put it there for some stupid reason. This was not done at the factory. It was done using 4 strikes as opposed to the '80' which is one go. It also appears larger than the number which to my mind is something Tokai would not have done. Does look like it was done outside the factory. Unless it was re-imported, it's leaving Japan for the first time just this week. _JDZ, no, I don't believe so. In the 1,000s of pre-1980 Springys and SilverStars I have catalogued, I have never seen this at the end of a fingerboard. If Tokai were to have used an extra stamp, it would have been a single letter 'E' - not a letter made up of 4 dents. I worked for the Tokai importer in Australia in the 80's and never saw this on any Model of guitar - ever - so my only conclusion is that maybe a guy named Eric wanted to personalise his guitar???? Regardless of how it got there, it does not affect the value or playability so just ignore it and keep playing. I thought about that too.... but of the hundreds of Springy's with E p'ups out there, this is the first any of us have seen this stamp. Not to change the subject but did we ever figure out what the D stamp was on the very end of the fingerboards, on a very few vintage LS examples?